Acne prone skin is one dreadful thing to experience. The constant breakouts, sensitivity to certain ingredients always keeps you on toes and thus you have to make sure that the skin is never too oily- excess sebum secretion in the pores will automatically lead to severe breakouts and thus the skin’s condition will deteriorate. Also, the dirt, pollution, residual makeup often accumulate in the pores and if they are only deep cleansed, it leads to dullness, pigmentation, breakouts, etc. the face masks help the skin in various ways. It will thoroughly cleanse the skin, control the oil production, remove blackheads and whiteheads, and exfoliate the dead skin cells and thus the skin look radiant and bright. Overall, the pigmentation is removed and the skin glows on its own. All you have to do is choose a face mask carefully by taking into account the ingredients it contains. 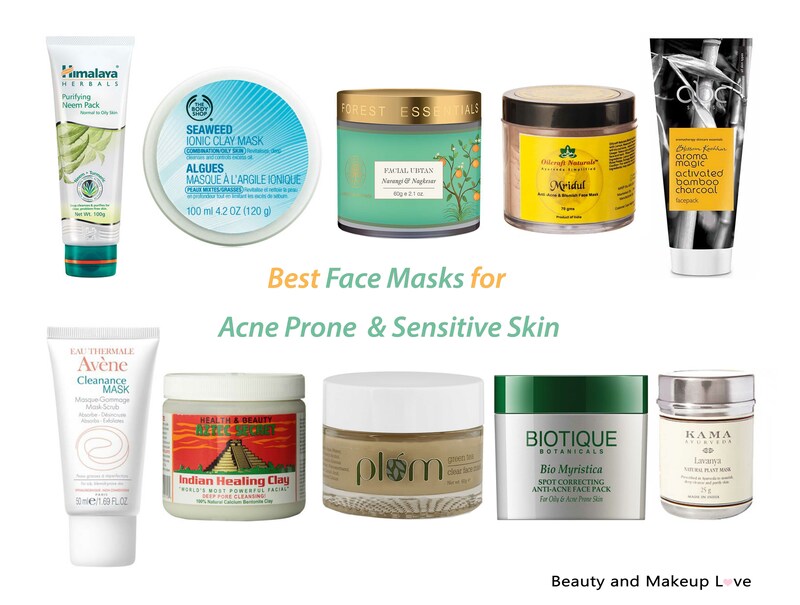 We have compiled the Best Face Masks available in the Indian market, designed especially for Acne Prone & Sensitive Skin. It includes both budget friendly and high end options so scroll down to know more about it. This is one of the best budget friendly skin care items for oily, acne prone and sensitive skin. It is dark olive-green in color and has to be applied directly and has to leave it to dry for about 10-15 mins. The pack is filled with various herbal ingredients like Neem, Fuller’s Earth and Turmeric which regulate excess oil secretion, cleanses the skin, prevent breakouts and improves the complexion. The product wipes off dirt, pollution and excess oiliness from the skin and combats the bacterial infections. It has no added fragrance and soothes the skin as well. This face mask is oily skin’s HG face mask (ever)! Read the full review >> Here. One more great face mask is from the house of The Body Shop which happily caters the need of oily, acne prone and sensitive skin type. It comes in a jar where you have to scoop out the product. The mask is thick in texture, greyish in color and spreads well on damp face. It is basically a deep-cleansing mask treatment that helps to draw out impurities from the pores and absorb excess oil, due to the presence of the natural ionic clay action. It controls the sebum secretion and keeps the breakout problem at bay. 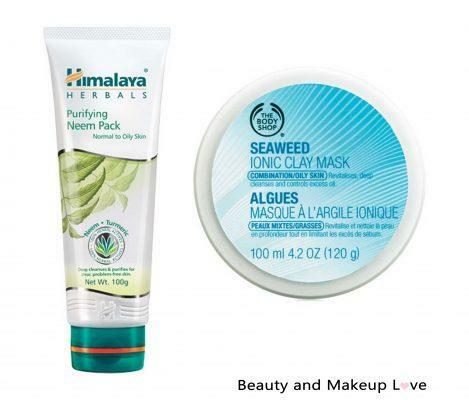 Also, the seaweed helps in clarifying the complexion and the skin looks fresh and rejuvenated. The smell is slightly overpowering which can be a con for some. 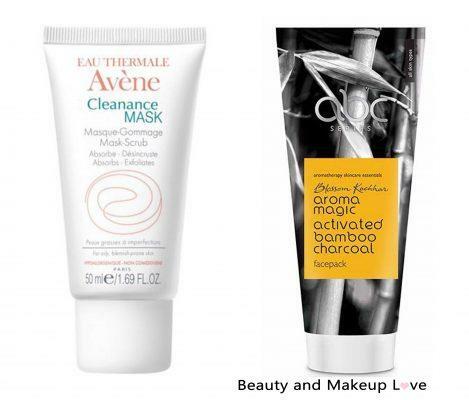 The Avene Cleanance Mask comes in a white tube form and hence a hygienic packaging to look out for! This is an exceptional good mask (one of the Best Face Masks) which helps in exfoliating the skin as well as deep cleansing the pores. It dries quickly and hence won’t have to wait for too long for it to dry. The mask will never irritate the skin or make it look red even though it’s got exfoliating beads, it never irritates the skin. It has the ability to eliminate various pigmented layers (with continuous usage) with the inclusion of AHA (Alpha Hydroxy Acids) and BHA (Beta Hydroxy Acids) complex. The skin feels smoother and softer and since it has Glyceryl laurate, it mattifies the skin and controls the hyper-production of sebum. Even though the price is on the higher side, you are paying for the quality it delivers. Further, not to forget – it is paraben free thus safe enough to be used even by the most sensitive skin! 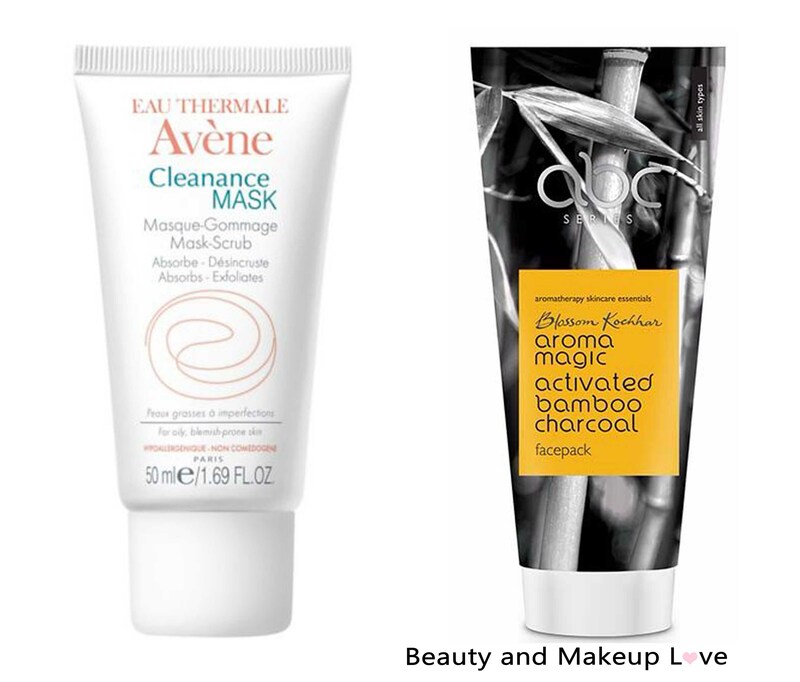 The Aroma Magic Activated Bamboo Charcoal Pack is one of the best budget friendly face masks for oily, acne prone skin. It is free of unnecessary chemicals and comes in a tube packaging which is easy to carry and is also hygienic. The mask is deep grey in color, with relatively thicker texture and spreads well. It has deep pore cleansing abilities due to the presence of activated charcoal and draws out deep-seated dirt, oil and dullness. The skin looks bright as the dead skin cells are well scrubbed off. It will also protect the skin with an anti-bacterial shield, shrinks and tighten the pores and the effect of the mask stays for days. Overall, this is surely a great option. Additionally. The product will last you a long time. 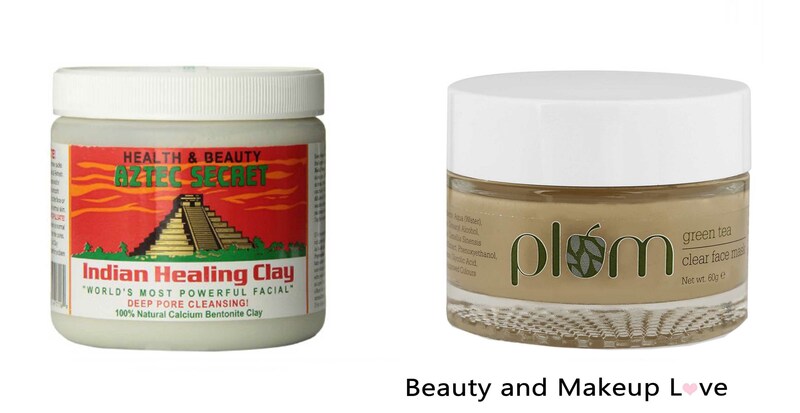 Known as the world’s most powerful face mask – Aztec Secret Healing Clay Pack is not just an ordinary face pack, it is probably the best ever face pack one could ever try for their skin. It is made with 100% natural calcium bentonite clay which is what does the trick for it being super effective on acne, oily skin, dull skin, dark spots, pigmentation and what not! This product works even on the toughest of acne, cystic acne to clear out the skin and works in brightening and clearing the skin. This face pack can help treat a zit overnight so it’s a perfect product to deal with sudden breakouts. This has become the Holy Grail face pack of those who tried it (worldwide) and we strongly recommend to give it a shot to see how good it works in dealing with all skin issues! People all over the world rave about it clearing their years’ old acne after having tried all possible remedies. This face mask (even tho it says – Indian Healing Clay Pack) isn’t available easily in India but you can sure buy it from Amazon tho higher than its actual price (which is Rs. 536) and we promise it’s worth an investement! Plum is becoming one of the leading chemical free brands for skin care. The Green Tea Clear Mask is housed inside a thick glass jar and the texture is thick and beige in color. The mask needs to be kept for around 15-20 mins after which it has to be washed off with warm water! The mask is specially formulated for acne prone, oily and sensitive skin. The Kaolin & bentonite will help absorb oil and control excess sebum production in the pores. The green tea extract is rich in antioxidants and helps in preventing acne. The Glycolic acid helps to revive the skin and gives a radiant glow. It removes dead skin cells and improves the skin’s texture with time. The aroma is also very refreshing! 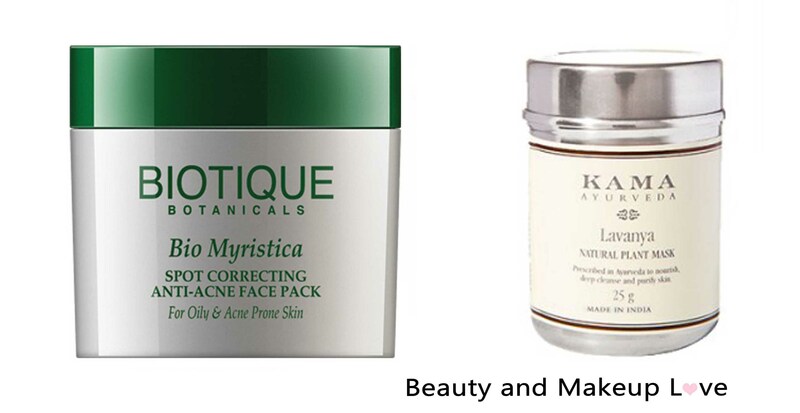 The Biotique Bio Myristica Face Pack targets the oily, acne prone skin and it comes in a tub packaging (which could be a lil messy, we prefer tubes over tub packaging). The product has a slight yellowish tinge in it and has a thick texture which gets easily spread on the skin when applied. It rapidly lessens the breakouts and can also be used as a spot treatment at time of emergency. It is enriched with potential ingredients like – Nutmeg, Turmeric, Long Pepper, Minerals, Haldi and Chandan which acts as an anti-bacterial formula that fights against the formation of bacteria thus reducing redness and inflammation on the skin. Since it is for oily skin, it has the tendency to dry out the skin a little, so we’d suggest not to use it if you’ve got dry skin or to use it once in a fortnight if you’ve got breakouts and dry skin. With regular use, it also helps in reducing acne scars! The Kama Ayurveda Lavanya Face Mask comes in a small jar like packaging and the actual product comes in a powder form. You can use it with aloe vera juice, rose water, lemon juice, orange juice or any other liquid extract of your choice. The face pack needs to be kept for 15-20 mins or until it dries! It has deep cleansing properties and refreshes the skin well. It doesn’t dry out the skin and effectively removes the layer of oil and dirt. It will surely help in controlling breakouts and also in lightening the marks. The product is 100% natural, cruelty free and free from preservatives, fragrances, colorants and petrochemicals. This is why it is an ideal choice for sensitive skin. Also, for the price, the product will last you quite a good time if you use it judiciously! A ubtan has various properties that are great for acne prone and oily skin. 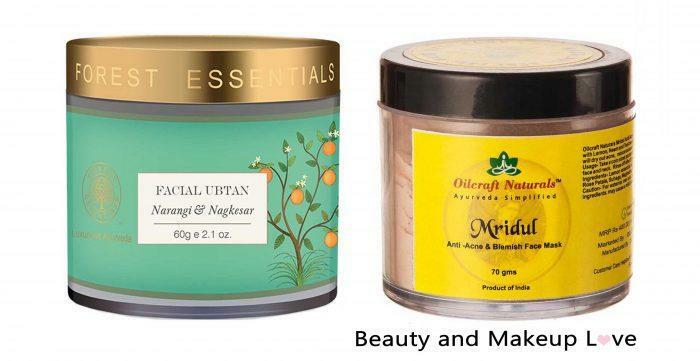 This Forest Essentials Facial Ubtan Narangi & Nagkesar comprises of the goodness of several ingredients that helps to lighten, brighten and soften the skin. The ingredients are Sundried Narangi peel Sundried lemon peel, sweet almond seed, Gotkula, Camphor, Marigold leaves, Anantmool, Nagkesar, Saffron (now that’s what we call full of Nature Goodness)! With regular usage when mixed with rose water, this face mask will tone the skin, reduce oiliness and remove dead skin cells. The skin feels smooth and supple with instant usage. Also, it helps in reducing the pigmentation with regular use! The Oilcraft Naturals Mridul Anti Acne Face Pack is a gifted product for extremely problematic oily and acne prone skin. It also comes in a powder form which needs to be mixed with certain liquid medium like lemon juice, rose water, etc. the natural ingredients, which is the blend of – tea tree oil and nutmeg, lemon, neem and clove oils helps in drying out the acne, cleansing the skin without stripping off the oils yet controls excess sebum secretion. With the passage of time it will also reduce the scars and blemishes and brings a radiant glow to the complexion along with improvement in the skin’s texture. Hope the post is helpful to you guys, do let us know if you have any queries down in the comments!